Urtukids of Mardin, Hosam al din Yuluk Arslan, AD 1184 to 1201. Bronze Drachm. Date & Mint : Damascus, AH 596 (AD 1199 to 1200). Reference : Mtchiner Islamic - 1043 to 1044. Size : 29.1 x 31.7 mm Weight : 13.77 grams. Grade : VF with a mid-brown patination. 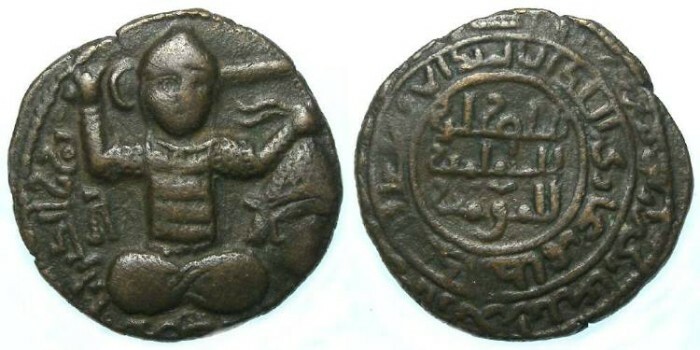 Obverse : Turkish soldier seated on the ground, with a sword over his shoulder, and holding a severed head to the right, with an Arabic inscription around.